NFL coaches are making better fourth-down decisions. The statistics say teams should go for it on fourth down. Are NFL teams finally wising up? Head coach Doug Pederson of the Philadelphia Eagles during a preseason game against the New York Jets at MetLife Stadium on Aug. 31 in East Rutherford, New Jersey. The lowest-hanging fruit in the NFL’s analytics revolution is for coaches to keep their offenses on the field on fourth-and-1. As pro offenses have become more effective, the state of being on offense has become increasingly valuable. Consider that in 1999, NFL teams averaged 1.56 points and 26.3 yards per drive while turning the ball over on 15 percent of drives. Compare those numbers to 2016, when teams averaged 1.97 points and 31.6 yards per drive and saw fewer than 12 percent of drives end on turnovers. Punting on fourth-and-1 has never been a worse idea. The decision must have come in the first three quarters before end-of-game factors encourage or discourage aggressive play. The offense had to be between its own 40-yard line and its opponent’s 40-yard line, so kicking a field goal wasn’t an option, but the team wasn’t so close to its own end zone as to make fourth down conservativism a defensible move. The game needed to be competitive, defined as within 10 points, to ensure the scoreboard wasn’t the primary factor dictating those decisions. From 1994–2004, teams went for it on these fourth-and-1 situations 28 percent of the time. From 2005–2014, that number ratcheted up, with teams going for it 35 percent of the time. And in 2015 and 2016, offenses stayed on the field for these fourth downs more than 40 percent. That trend is still holding halfway through the 2017 season. Admittedly, because of those three limiting factors, and because fourth-and-1 plays aren’t that common, the data set here isn’t very large. Through nine weeks, teams have faced 24 fourth-and-1 decisions between the 40-yard lines in the first three-quarters of tight games. (This week’s Thursday night game between Seattle and Arizona is not included in these calculations.) Teams have punted 14 out of those 24 times. While that may not sound great, that 42 percent rate is consistent with what we saw in 2015 and 2016. Slowly but surely, teams are getting more aggressive on fourth downs, even if they are still falling far short of how aggressive they should be. Given the constraints I laid out, a rational coach would go for it on fourth-and-1 pretty much every single time. Coaches who have gone for it in these situations have gotten some positive reinforcement this year, as teams converted on 8 of the 10 fourth-down attempts in my data set. Going for it in these cases is the optimal decision, even if that decision looks bad in hindsight following a failed attempt. But seeing good process yield good results is likely to encourage rational behavior around the league. Consider the matchup in Week 3 between the 0–2 New York Giants and 1–1 Philadelphia Eagles. The Eagles won on a last-second, 61-yard field goal and haven’t lost since. Meanwhile, the loss all but ended the Giants’ postseason dreams, and New York has since collapsed to 1–7. Although that long field goal received most of the attention, Philadelphia wouldn’t have been in a position to win the game without some aggressive early game decisions. In the first quarter, the Eagles had fourth-and-1 from their own 47-yard line. Quarterback Carson Wentz took a quarterback sneak 2 yards up the middle for the first down, keeping alive an eventual 18-play, 90-yard touchdown drive. In the third quarter, with Philadelphia still leading 7–0, the Eagles went for it on the Giants’ 45-yard line, with Wentz again sneaking ahead for the first down. Four plays later, the Eagles were in the end zone. Those two touchdown drives only happened because head coach Doug Pederson—with the support of an owner, Jeffrey Lurie, who has expressly supported such aggressive tactics—made the right decisions on fourth down. All 10 times a team has gone for it in these situations, the offense has called a running play. That includes three quarterback sneaks (all by Wentz), four carries by a running back, two handoffs to a fullback, and a Russell Wilson read-option play where he ran for 9 yards. A 100 percent run rate is obviously extreme, although not totally unexpected in a sample of just 10 plays. From 1994–2016, teams rushed on 84 percent of the plays in these situations. (That likely includes a few called pass plays that turned into quarterback scrambles.) That rate holds true from 2013–2016, too. Given the decision to be aggressive by keeping the offense on the field, it seems coaches tend toward conservative play-calling. If a pass fails, it’s easy to blame the coach; if the run fails, it’s easy to blame the offensive line. For comparison’s sake, we can look at what teams do in the exact same situation—the game within 10 points, between the 40-yard lines, first three quarters—but on third-and-1. Since 1994, teams have called a rushing play 77 percent of the time in that scenario. On those rushing plays (which, again, include a few quarterback scrambles), teams have picked up a first down 71 percent of the time and averaged 3.2 yards per play while scoring a touchdown just 0.3 percent of the time. On passing plays, teams have gained a first down 59 percent of the time and gained an average of 7.6 yards and scored a touchdown on 2.2 percent of plays. In other words, passing has a lower success rate but carries a more substantial reward. From a game-theory perspective, even if a running play is the superior call, it will never be optimal to call runs 100 percent of the time. After all, a predictable offense is a defense’s best friend. But again, there’s another factor at play: When a coach goes for it on fourth-and-1 and the pass falls incomplete, that coach is going to be criticized 100 percent of the time. A fear of criticism helps explain why a majority of teams will still punt in this situation, even as the ratio of punting to going for it inches closer to 50-50. That ratio would be even closer if Marvin Lewis wasn’t running things in Cincinnati. In the Bengals’ Week 2 game against the Houston Texans, Lewis sent out the punting unit twice in the first half on fourth-and-1, first at the Texans’ 46-yard line and later at the Bengals’ own 42. Passing up makeable fourth-down attempts early in the game often forces teams to be more aggressive later on. Trailing 10–6 in the third quarter, Lewis wisely kept his offense on the field for a fourth-and-2 at the Houston 19-yard line; the Bengals converted but still settled for a field goal. Later, down 13–9, the Bengals had to go for it on fourth-and-9 with 1:13 remaining; the pass sailed incomplete, and the Texans won the game. Knowing what he did then, I suspect Lewis wished he’d gone for it on fourth-and-1. 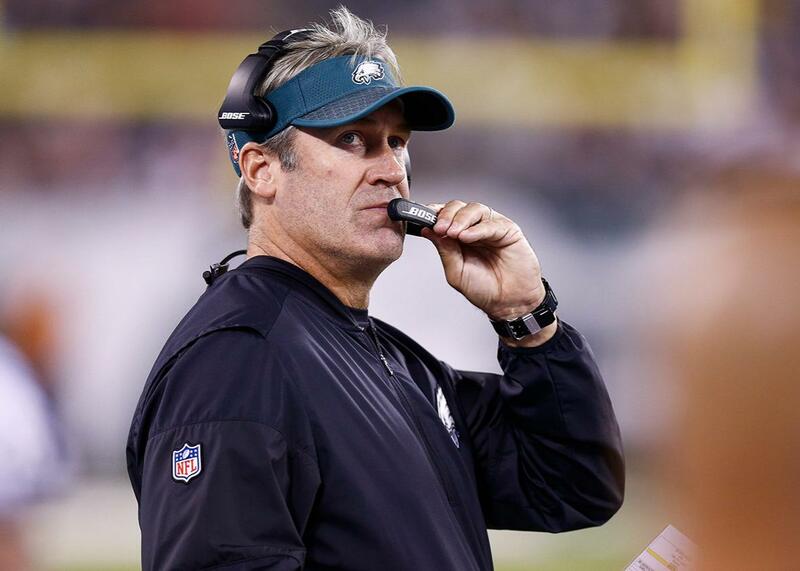 The coach that Lewis and his NFL brethren should look to for inspiration is Philadelphia’s Pederson—one of the front-runners for the NFL’s coach-of-the-year award. Overall, the Eagles have faced 13 different fourth-and-1 situations this year. They’ve gone for it seven times and have converted all seven. With results like that, expect Philadelphia to keep being aggressive and for that to remain the smart decision.